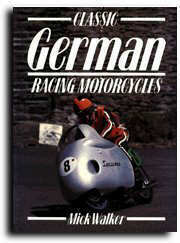 Mick Walker covers the gamut of Germany's quite astounding contribution to motorcycle racing in his usual meticulous fashion, illustrated with many rare photographs from the early days of GP and TT racing. Marques covered include Adler, BMW, DKW, Fath, Horex, Koenig, Kreidler, Maico, Munch, MZ, NSU and Simson. Paperback from Almark Publishing Co. Ltd.